So, once again, it has been FOREVER since I’ve been on here. I guess I let life sometimes get in the way and sometimes, to be real honest, I don’t feel like I have much to say. Not that I really have that much to say today either, but I felt the urge to let you know what’s been happening! And, as usual, I will do it with TONS of pictures. As you all know, I kind of like to take pictures, which I guess is kind of an understatement. I LOVE PICTURES! So, first off, I will let you all know that I will be running (hopefully) in this weekend’s Fargo Mini Marathon half-marathon. This is the first time Al and I have done the half at this race. We have done the 10K a couple of times and last year, we did the Red River Double, which is where we ran the 10K and then we race the 5K. It was pretty cool. I am looking forward to this race, at the same time, I am nervous and feeling a bit apprehensive. Why? Well, I have a bum foot. Per my own self-diagnosis, I have the lovely plantar fasciitis. Oh joy! 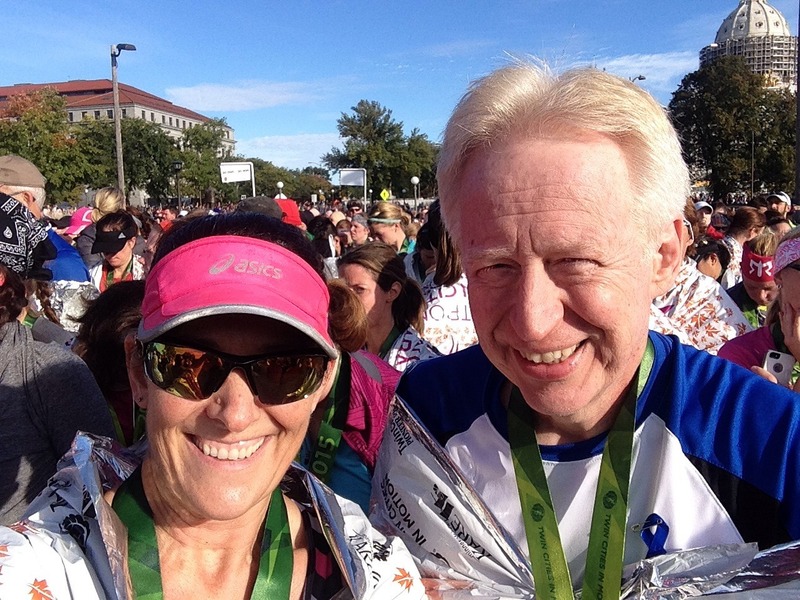 A week ago Sunday, on Sunday, October 4, Al and I participated in the Twin Cities in Motion TC 10-Mile race. 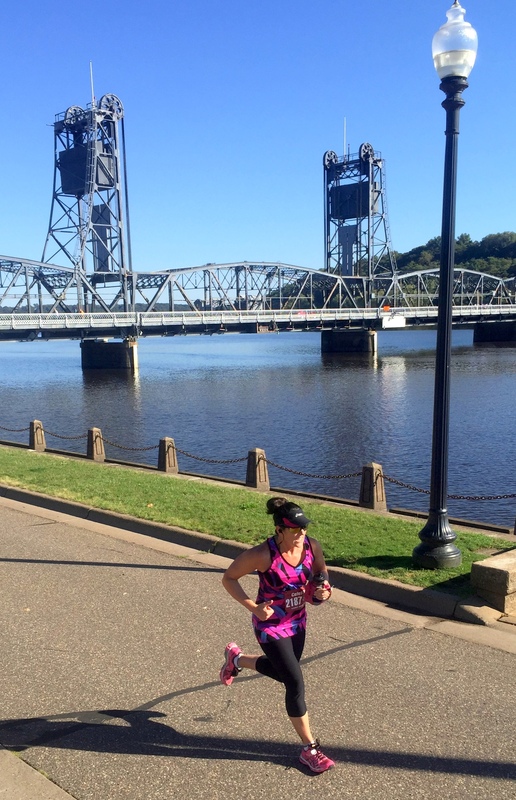 Two weeks prior to that, on September 19, we ran in the Stillwater Log Run 10-miler and also, on Saturday, September 26, we ran in the Legends 10K. We have been really putting in the miles lately – at least at races. The Stillwater ran was mostly downhill, but the Legends 10K and the TC 10-mile had plenty of uphill running. And if you noticed, I said I’ve been doing a lot of running at races. My day-to-day running, on the other hand, has been slacking…unfortunately! But, when you teach 6-8 classes per week, there doesn’t seem to be time – or should I say energy – leftover for running. For the time being, I am down to six classes per week! Anyway, back to the TC race. As I walked toward Al, the burning in my left toe subsided, disappeared really. I was very thankful for that. But I was not thankful for the fact that I could start to feel the pain in my right foot. At that point, I checked my phone and saw the text from Al telling me where he was. I found him almost immediately and as usual after a big race, we fell into each other’s arms for big hugs – oh okay, and some smooches! I immediately asked him how the race went and he said it went pretty well, and that he was happy with his time (1:25:01) and then we talked about the course as we made our way over to the chaos where we had to pick up our T-shirts. We were both a little chilled – Al more than me because he had to wait for me – so we made sure to wrap up in the mylar blankets that were being handed out. As we were waiting in the stupidly long line for our T-shirt, I had to take a quick picture. Not sure why because we have dozens like this one, but there is something about this photo I love! I just love the smiles on our faces. And the background. And the State Capitol off to the right. And, I don’t know, just everything about it. So, are you wondering how I did? Well, I got a PR (personal record out of it!). Yep, despite all the uphill climbs, I got my best 10-mile time ever. First off, I will tell you that my official time at the Stillwater 10-miler was 1:48:49 and this is a look at my splits, overall pace and elevation. Lots of downhill. Not too bad. My overall pace was a 10:30 minute mile. That actually made me quite happy. I felt good about this run, especially because I hadn’t ran more than 6 miles at a time in about two or three months. Now, about that PR. 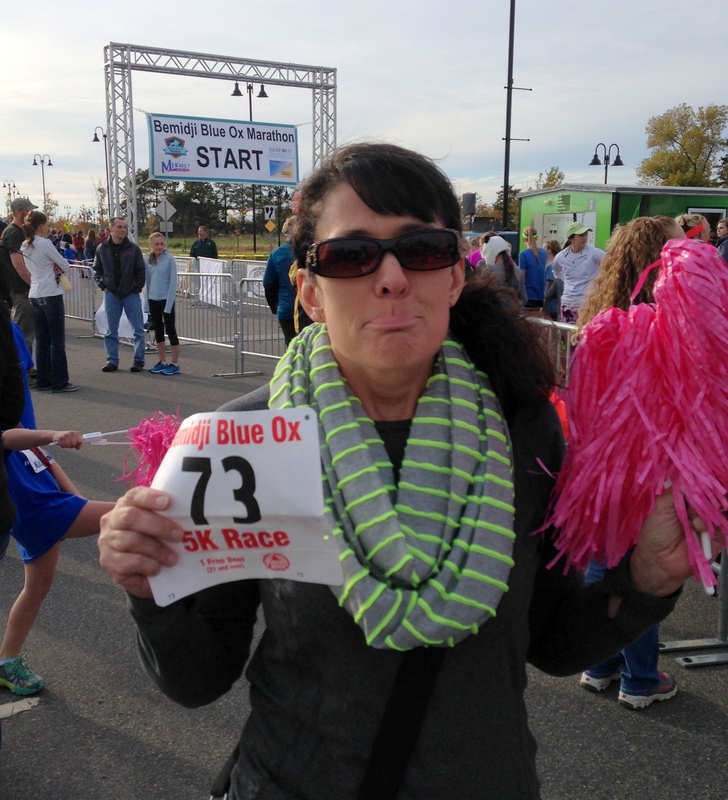 My official time for the TC 10-mile was….wait for it………….1:43:17. Yep, I beat by Stillwater time by more than five minutes! Pretty exciting considering there was a lot of uphill! My overall pace was a 10:06 minute mile. Seriously, I was PUMPED! After we made it back to our hotel, we both crashed on the bed and rested just a bit before getting ready, packing up and heading home. When I tried to get up the first time after lying there for about a half an hour, I nearly toppled over because I could barely put any weight on my right foot – more specifically, the inside of my heel. It felt painful, kind of like a really deep bruise. But more painful. I was not a happy camper. The next day, Monday, was not much better. 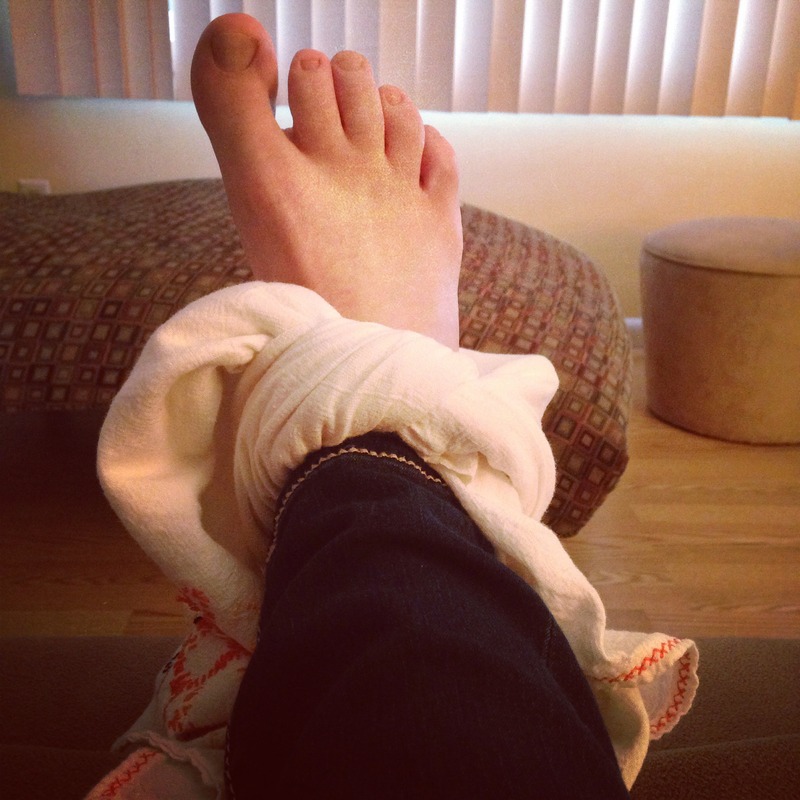 I started researching and came up with what I mentioned earlier……plantar fasciitis. I will first tell you that I have not ran since Sunday, October 4 and yes, I AM going to try and run the half-marathon this Saturday. I will also tell you that I have been doing everything in my power to help it heal quickly or at the very least, not be so cotton-picking painful. I have iced it. I have massaged it. 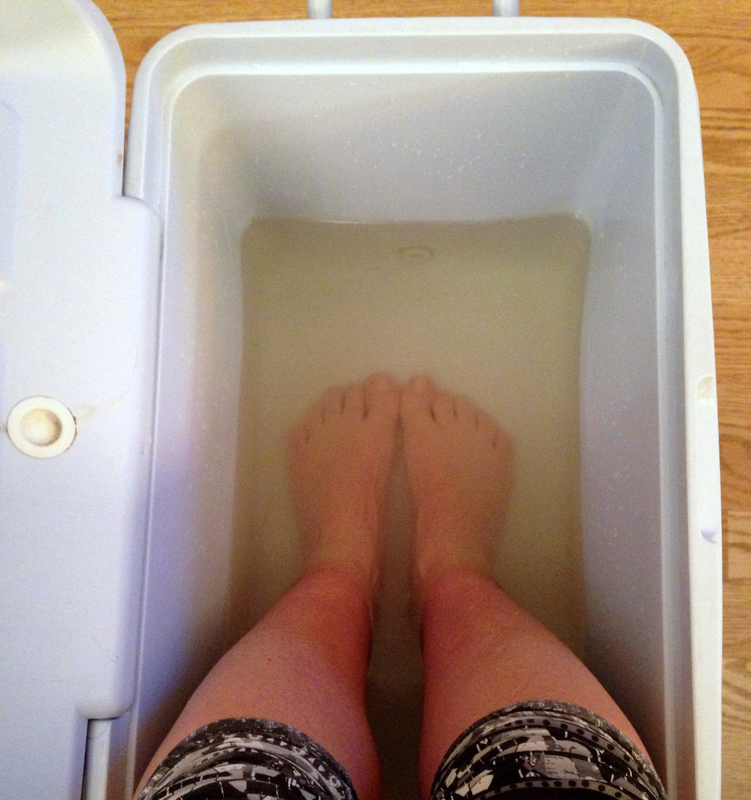 I have soaked it in Epsom salt (yes, in a cooler, pictured below). I have used Young Living Essential Oils on it. I have foam rolled my calf muscle. I have taken Ibuprofen. I have taken it easy when teaching my classes – no cardio moves for me. 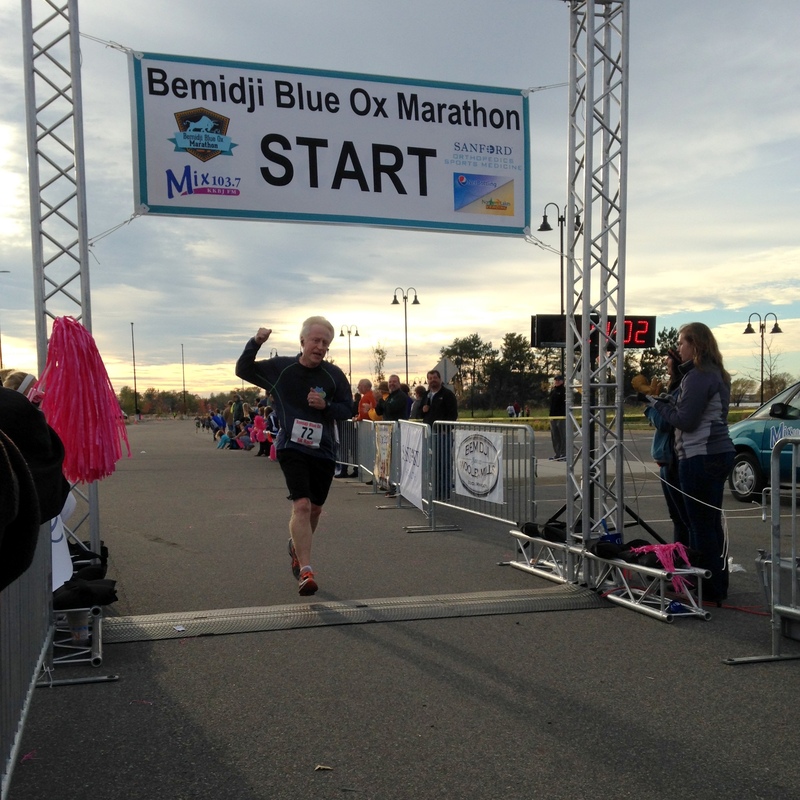 I skipped the Bemidji Blue Ox 5K run (photo below). I have rolled it on a frozen bottle of water. I have stretched it. 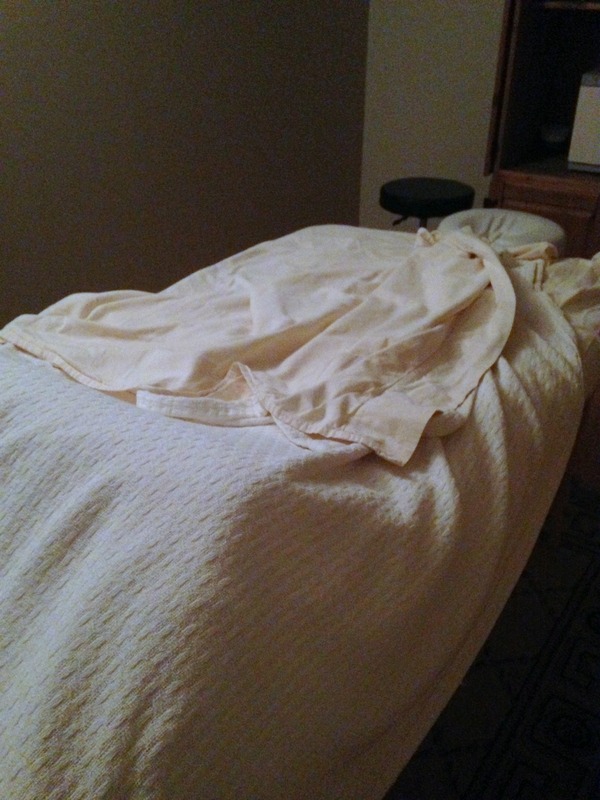 I’ve had at least four real massages on it (two were full body massages, but they concentrated on my legs and foot) (photo below). I have done what I needed to do. And I will tell you this, it has been the hardest couple of weeks of my life. Injuries are NO FUN! At. All. But, I will also tell you this. It is feeling better and better and better with each passing day. On Friday, I am going to have a chiropractor look at it and tape it up for me with some KT Tape so hopefully Saturday will go okay. I now have no time goal in mind for Saturday’s half-marathon. I honestly just want to cross the finish line. And if it takes me three hours, so be it. Sorry, Al, you might be waiting longer than usual for me! So that is about it for what’s been going on in the fitness/running world. Oh wait, that 5K in Bemidji I skipped. Yep, my husband still ran it and he NAILED IT. It was honestly so fun to be there, cheering him on, watching him cross the finish line. I couldn’t be more proud of him. He rocked the hell out of that race. 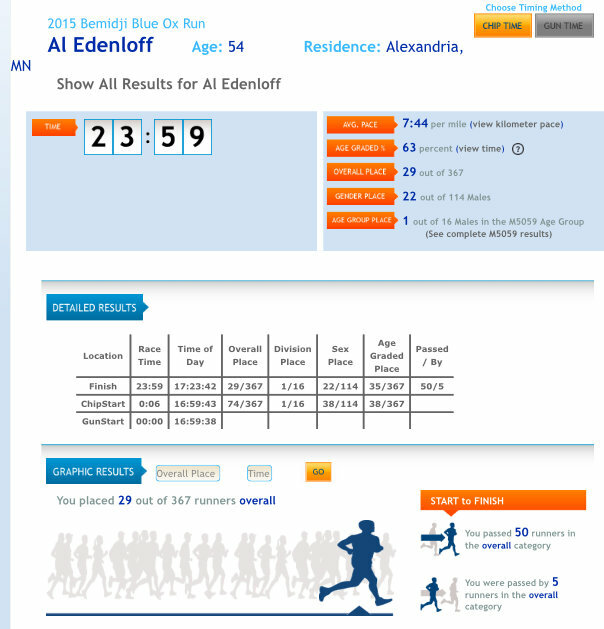 He got first in his age group – out of 16 runners, mind you. His goal was to finish in 24 minutes or under and he did just that, finish in 23:59! Way to go, Al! Love this pic of him. 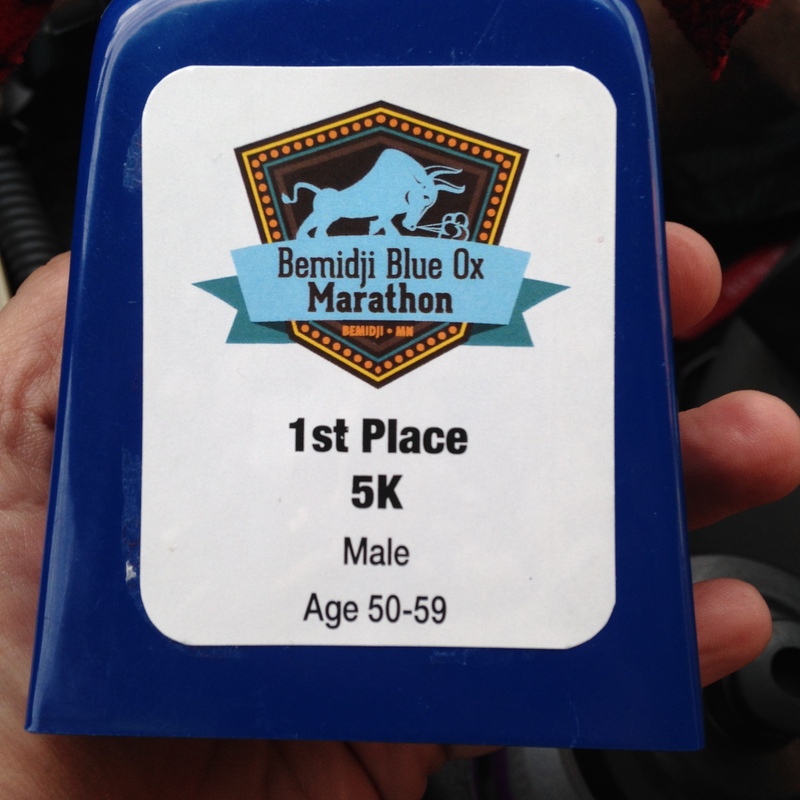 His official results and his first place award – a cow bell! So freeking cool! I should mention that one of the reason why we chose to go to Bemidji was to cheer on Amanda. I promise to write more about her next time. And, I also promise, you don’t want to miss it! Al had a coupon for a free bottle of wine (how cool is that?) from the Green Mill, which is why we chose to eat there. We weren’t super hungry, but at the same time, we were. 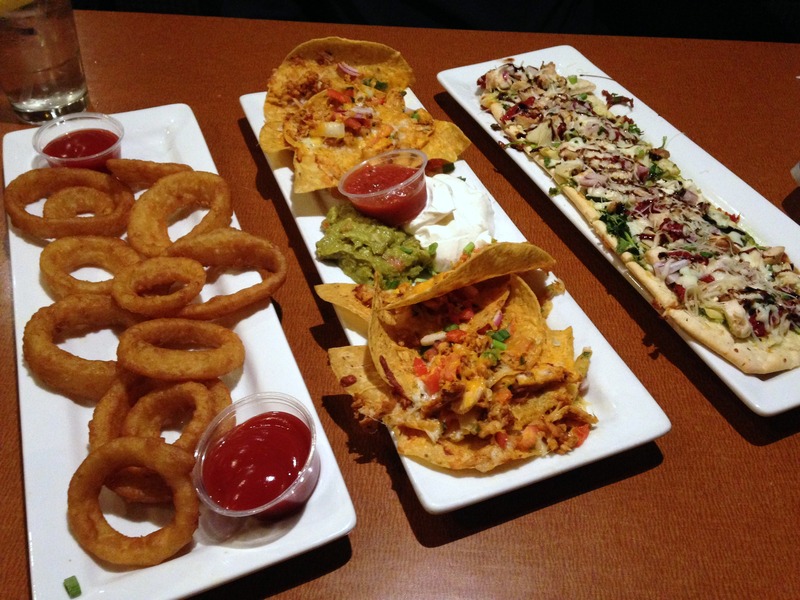 We opted for appetizers – THREE appetizers – the onion rings, nachos and garden flatbread. OH! MMMM! GEEEE! After we left Green Mill, we opted to stop at the Bemidji Brewing Company for our free beer from the Blue Ox race. There was a tag on our bib for a free beer and who’s gonna pass up free beer? Right. It was fairly decent. 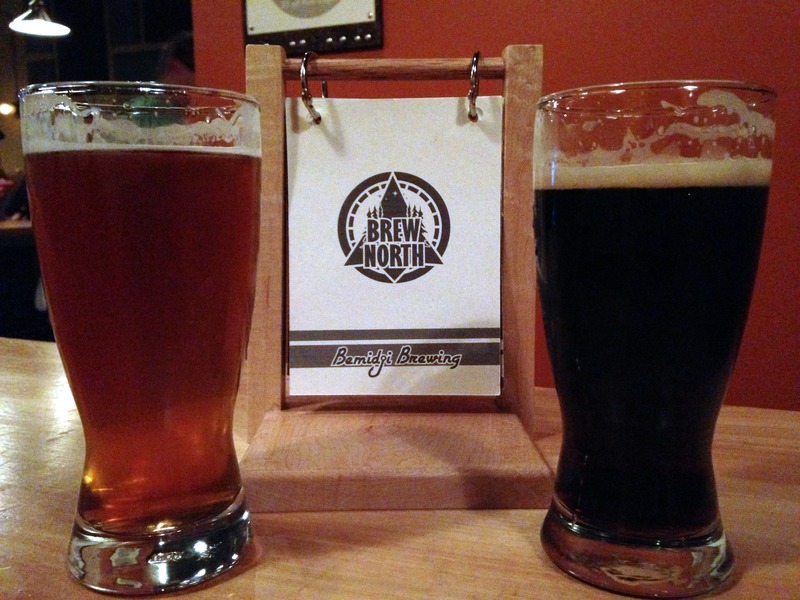 I had the Robust Porter (Nitro) and Al had the Oktoberfest. We were both still stuffed from our appetizers that we turned in early and it was lights out by 10 p.m.! We had a big day on Saturday. Time to cheer on Amanda. Seriously, wait until you read about her. I am beyond proud of her and that is all I am going to say now. You just have to be patient. On Saturday night, after we got home from Bemidji, both Al and I didn’t really feel like cooking or eating much. We had stopped at Country Kitchen (yes, these still exist) for a late lunch and so we weren’t particularly hungry. We both had the salad bar and then Al had a burger and onion rings, which honestly, I think I ate the majority of these. I didn’t order anything else besides the salad bar and the onion rings looked so good. Al didn’t mind sharing. Not sure what my deal has been lately, but I have been so hungry for onion rings. I don’t think I have eaten onion rings in probably five years. And, I love them dipped in ranch dressing. YUMMY! Actually, talking about that reminded me of something I have been meaning to write about. Yes, I do ramble. This may come as a shock because everyone knows my history with Weight Watchers……..BUT, I have stopped counting points. I actually stopped several months ago, but haven’t said anything because for some reason, it makes me feel like a failure. But the thing that doesn’t make me feel like a failure? I haven’t gained my weight back. Okay, I gained a couple of pounds. But, I have been maintaining between 147 and 149 (145 is my ideal!) for the past six months. For reals. And I guarantee, my eating has not been perfect. By any means. BUT……my exercising has been WAY more than it used to be. So, I guess that is the reason for the maintaining. I will say that my eating honestly hasn’t changed that much, maybe a few more sweets than normal and maybe my portions have gotten slightly bigger, but to be honest, other than the exercising, not much has changed. 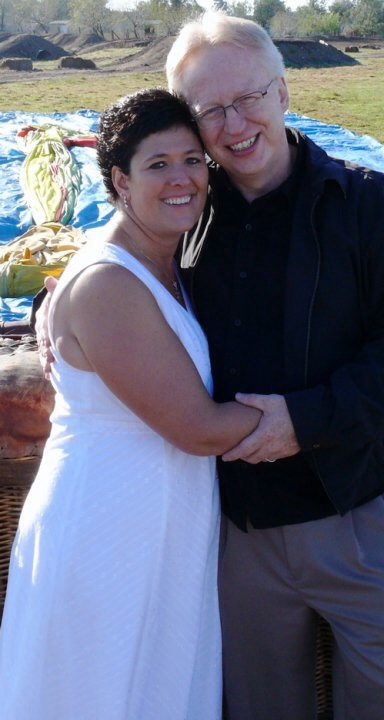 When I started Weight Watchers, back in November of 2008, I wanted to make a change for good. I did NOT want to diet. I wanted to make a lifestyle change. And, honestly, that is what I have done. This is my life. Eating healthy (most of the time) and exercising (most of the time). I now try to follow the 80/20 rule. Eighty percent of the time, I eat healthy. And 20 percent of the time, I let myself indulge. For me, it works. I exercise at least FIVE times per week. I average more than 10,000 steps per day. Being active is a HUGE part of my life and I wouldn’t want it any other way. Truly, I wouldn’t. I don’t mind putting in the time and effort if it means I get to eat a cupcake or two or three! I feel good. I have energy (most of the time!) and I am happy with how I look. Anyway, I just wanted to share that with you all. I still LOVE Weight Watchers and wouldn’t be where I am today if it wasn’t a part of my life. If my weight starts creeping back up, I guarantee you my tracker will be filling up fast and my arse will be back to those meetings. The meetings I still treasure to this day. This me – the old me – is never coming back. Period. This me – the new me – is here to stay. Period. 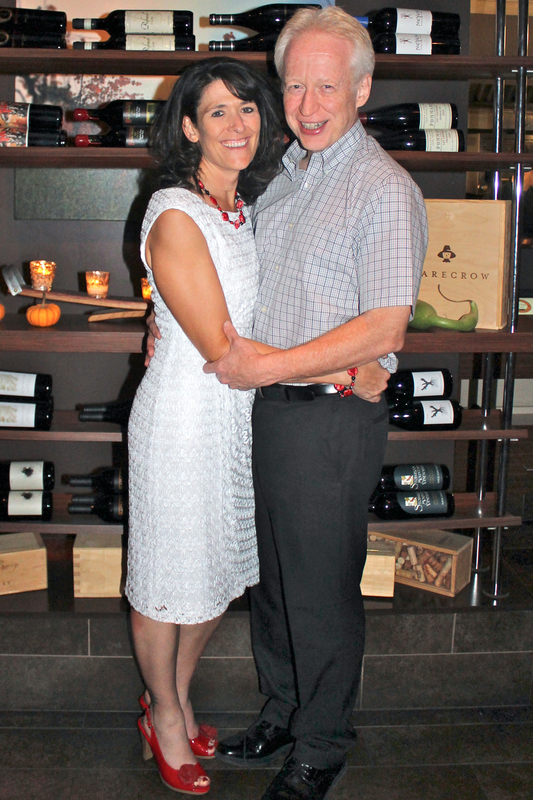 October 8, 2013 – our five-year anniversary. 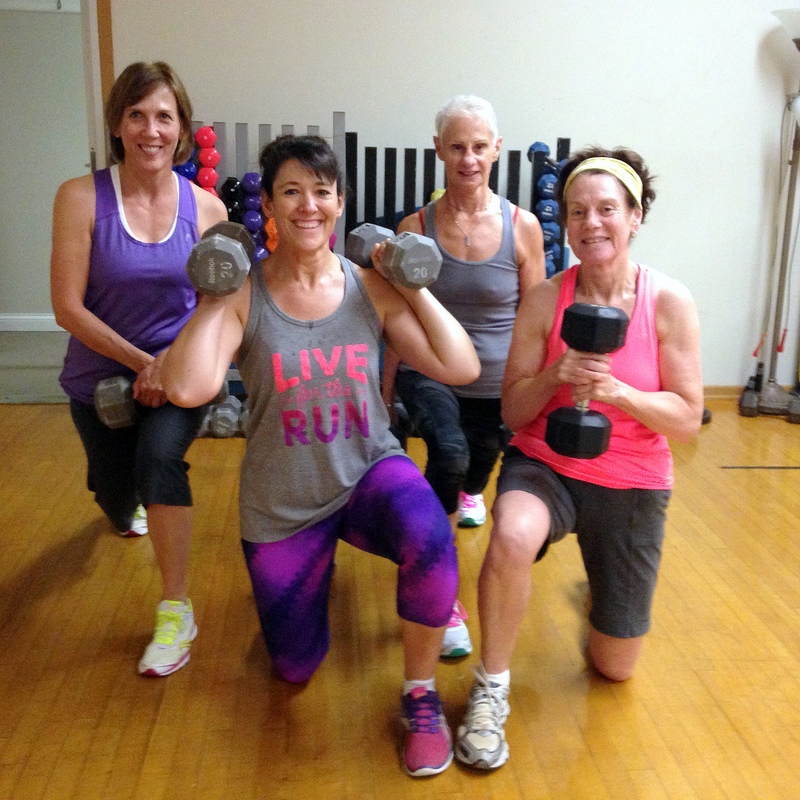 Some of the ladies I teach at Vital Fit Club – some of the coolest ladies, that is! My birthday this year (September 30). After teaching two classes and running 4.3 miles, I enjoyed my cupcake and beer. 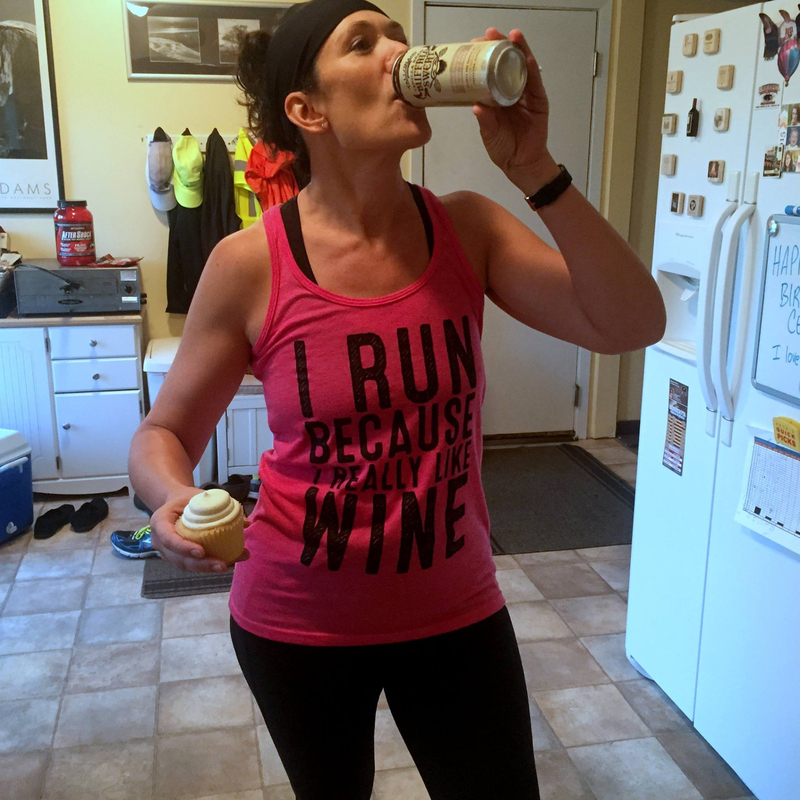 And yes, I do run because I like to drink wine! I got this awesome tank from my sister for my birthday! LOVE IT! A great picture my hubby captured of me running to the finish line at the Stillwater 10-mile race in September of this year. My work picture from Vital Fit Club. This was taken in May or June of this year. 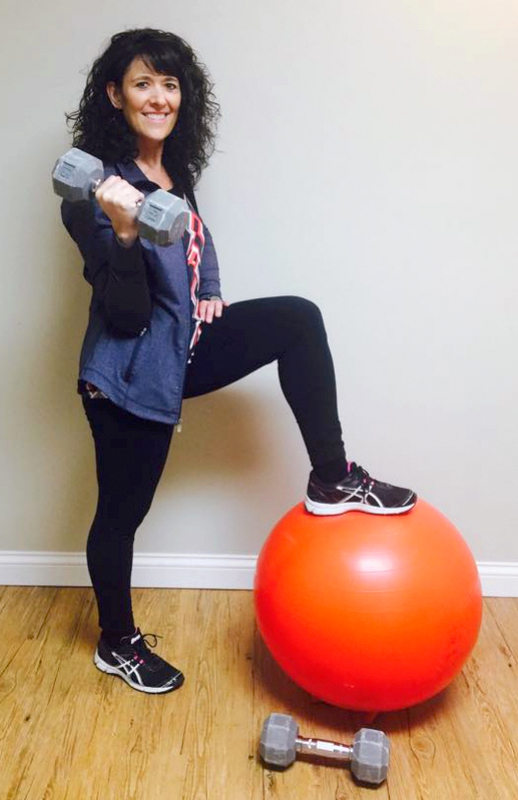 I am so proud of your accomplishments — both exercising and the maintaining of your weight!! Miss you at the Fergus Falls WW, but I think the change was very POSITIVE for you!! Love your blog! Previous Previous post: I royally screwed up!